Since this is the first public article by International Socialist Network supporters in Scotland, it may be useful to introduce ourselves. The ISN (International Socialist Network formed from the recent split in the SWP) is very much in its embryonic stage and therefore we greatly welcome being part of discussions in Scotland and across the UK with other socialists, anti-capitalists and non-aligned activists around the possibilities and way forward for left unity/renewal. The ISN is based on the principle, revolution from below as the sole means by which socialism can be achieved. It is refreshing that those currently engaged with the network are working to develop our ideas, which come out of Marxist revolutionary politics, on such questions as revolutionary organisation, feminism and left unity – and we recognise that we have much to learn from others in doing so. Marxism should be a living, breathing tradition. This means healthy and open debate, taking a realistic look at the past decades of neo-liberalism, changes in the composition of the working class, identifying the challenges faced by the left in the 21st century and seeking to modify revolutionary theory and practice to meet those challenges. The ISN seeks to be a forum in which such debate takes place and a network of activists committed to revolutionary socialism form below. Readers will be aware of the circumstances in which the ISN came to be formed by members of the Socialist Workers’ Party – more information is available here. Rather than rerun that history, we want to take this opportunity to engage with others in developing our understanding of the present period and working through our attitude to concrete issues of left realignment in Scotland. We start, as most socialists do, from the principle of “fighting in the interests of the working class”. There are those that argue that these interests are best fought through elections, parliaments and governments and those,like the ISN, who believe that this goal can only be achieved through revolution. This is, of course, the division into ‘reformist’ and ‘revolutionary’ strategies that we, and others on the left, became very comfortable debating because it offered us a series of ready-made answers. Yet, the movements of the first decade of this century from the anti-capitalists of the early 2000s to the ‘Indiginados’, Occupy and anti-austerity protests have forced us out of this comfort zone. These two roads to socialism have faced a direct challenge from many other forms and methods of organising and activity. Many of these new forms of organising emerge from anarchist and self-defined ‘horizontalist’ movements – leading to hasty and counterproductive dismissal of these alternative ways of organizing by those who keep a focus on independent political organisation within the working class and trade union movement as the main strategy for revolutionaries. Many new activists have come into politics through those movements. And therefore it is crucial to understand why over the last couple of decades many more new activists have been attracted by such movements rather than avowedly socialist organisations, whether they be reformist or revolutionary. We agree with Ben Wray of the International Socialist group that this reflects a great weakness on the part of the Marxist left. Of course, the utter capitulation of all mainstream political organisations to neo-liberalism has led to disillusionment with the whole electoral system and any kind of “party organisation’ – not to the generalised apolitical apathy with which middle-class commentators comfort themselves, but nonetheless an enormous challenge for socialists. Furthermore, it is not enough simply to point to the mainstream parties as the source of this disillusion: many activists are repelled by party-based politics not because of a lack of contact with left-wing parties, but because of their own experience within those parties. Does that just mean we were wrong about revolutionary socialism and organisation? Capitalism is still here, and the problems to which revolutionary socialist organisations were an answer are also still posed. This is not the first time historically that left organisations and working class political representation has been in crisis. As Jules Alford’s article (Some Notes on The British working Class 1900-1914) argues on the ISN web site, that… “There are instructive parallels with the long ‘downturn’ that proceeded the Great Unrest 1910-14 when only one in eight workers held a union card and today when union density in the private sector has fallen so low.” The institutions and consciousness of the class are at a historically low-level and as a result the left is in a critical state and needs to adapt. It is not a pretty picture but we are where we are – or, as Marx put it “the conditions of this new movement must result from the premises now in existence”. Marx, German Ideology (1845). The door to a revival of the left has been opened. It is up to us to decide whether we take the doors off their hinges or re-close them. We have a historical role to play now in the development of a new left movement. The shift in working class votes from the Labour Party to the SNP has highlighted the continued shift of the Labour Party away from the working class. Recent changes to its internal structures and election processes, and the increasing dominance of a middle class professional elite who control the party, can only further detach working class people from the Labour Party – and we would expect therefore from the notion that Labour can be transformed from within. From its foundation the Labour Party has always pursued the goal of building an electoral machine, with the final result that the party leadership now competes to best serve the interests of neo-liberalism. It is shifting away from being a working class “movement” , with a growing fetishisation of parliament and leadership of civil society functionary bodies. The Labour Party currently sees its aim for working class people as attempting to lift a minority out of the working class (as Joahnn Lamont put it out of the”something for nothing society”) as opposed to building a movement that, in John Maclean’s words, encourages the working class to “ rise with their class not out of their class”. The SNP electorally has out flanked the Scottish Labour Party (SLP) to the left and over the question of independence the SLP has shot itself in the foot by alignment with the NO Campaign. The STUC’s position was recently stated by General Secretary Grahame Smith rather than engage with the Radical Independence Campaign he argued that “The challenge that matters in Scotland, ‘whether independent or as part of the UK’, will be how wealth is redistributed and that is a question of tax, public services and how we go about improving pay equality in Scotland.” First of all, this is not just a question of tax, services and pay equality but of class struggle – a struggle for which the independence campaign may change the terrain. It would be premature to extrapolate from the current poor state of the Scottish Labour Party the terminal decline of the party as a whole in terms of its relationship to and support within the working class. This leads to the question: should we seek to involve and work with those who view themselves as left-wing activists who exist both within the Labour Party left and/or in the Trade Unions in the discussions over left unity/renewal ? We would surely have welcomed and indeed tried to win STUC and Scottish Trade Union representation into the Radical independence Campaign so why not encourage those who campaign to regain the Labour Party to a reformist road to socialism, even if we are sceptical of this strategy, into the process of building left unity? One obvious difficulty would be around the question of winning the unions to a position of breaking the financing of the Labour Party by the trade unions. However, although there exist many such contradictions within the trade union movement – any possibility of raising the levels of trade union membership and increasing its participation within grass roots anti-cuts movements, should certainly be something we would welcome and engage with. This lays a challange at the feet of those Labour Party and trade union left activists to break with their fears of the radical left and sectarian fears of “the Trots under the bed”. As Sarah Collins stated in (Issue 75) of Scottish Left Review the trade unions must learn to “Dance with the people that brung you. Those on the left are not your enemy”. To date, certain left union officials have been keen to speak on a plethora of “united front” anti-cuts platforms but then never to be seen to positively and actively back such campaigns or encourage their union members to become active in them. The only exceptions are when such activity has been specifically called by their union sector and only if ever raised and discussed within the tight confines of the union offices or branches and with “trusted” reps. If the trade union left is to play a serious role in the fight against austerity then it must break out of its comfort zone, open its doors to the movement and fight with the anti-cuts movement, not just in words but in day to day action and activity. As John McDonald also states in (Issue 75) of Scottish Left Review “…it is the trade union movement that now needs to step up to the plate to mobilise and support a wider community campaign of resistance and austerity”. 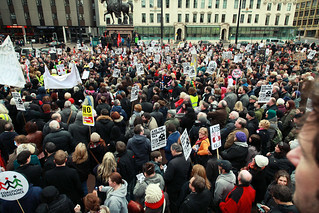 However, local community campaigns alone will not be enough to stop the austerity attacks on the working class unless linked to a national co-ordinated campaign which works to bring together both political and industrial action.The trade unions must begin to flex their ‘industrial’ muscle if they are to be viewed by the wider movement as any more than “boardroom” activists. The trade union movement cannot continue to confine itself within the restrictions of anti-trade union laws or wait for the glourious day when some elected Prime Minister miraculously reverses the law . Unite’s setting up of community branches is very welcome, but when Len McLuskey also thinks that Ed Miliband is the political answer to austerity, it does raise the question ; are the community branches a base for recruitment of possible electoral campaigners for Ed Miliband and his brand of austerity lite or a genuine attempt to rebuild fighting unions? It is one thing building branches in the community but quite another to build a union prepared to fight! The truth remains to be seen in relation to union community branches, but one thing is for sure we cannot afford to go through another 30 years of broken promises from the Labour Party both when it is in power or in opposition neither can we suffer to wait until the “time is right” approach of the trade unions, if we do, we will end up where the Chartists had to begin. We cannot begin to build the left unless we are genuinely prepared to bury many hatchets from the past, for many. This will not be easy for any of us, yet it is essential. Of course, the experiences of the past leave divisions that will not be buried over night. Hence, open political meetings and open discussions on future joint activities must be viewed as a process of rebuilding trust and confidence amongst those who have been active for the last couple of decades and more. For the International Socialist Network this process of left unity/renewal has the potential to gain pace and growth but only if we assist in creating more open, democratic and less rigid structures which permit those coming into left politics the space to develop new left organisational structures fit for the battles of the 21st century and for regeneration of a new left. This does not mean that we become less ideological but have to become more ideological – in the sense of having a more up-to-date, accurate and fundamental analysis of contemporary capitalism that can guide our struggle. Questions around the development of theory and its relationship to practice become more crucial, therefore. For too long, the left has been guilty of saying to new activists: “here is our theory and here’s how you will apply it”. Such a dogmatic approach has led on many occasions to wrong practices and ultimately contributed to the failure to retain new activists and grow the left. Hence the type of democratic structure within any new left project must be one which is developed and led from the bottom up. We would rather see 1000 more new grass roots activists fighting for the interests of the class and making mistakes along the way as they cut their political teeth, than a small group thinking they have all the answers. At the high-point of the Stop the War and anti-capitalist movement in the early 2000s, a left realignment on an electoral basis did occur. In 2003 the left thought it had found the answer with the election of 6 SSP MSP’s and in 2004 Respect in England made important electoral gains. The successes of Rifondazione in Italy soon passed into defeat following party’s compromise with the participation of the Italian state in imperialism – although the current ground being made by Syriza in Greece may provide a more positive example. Just as the organisational formulas of the revolutionary left cannot simply be repeated and replicated, so we should also be cautious about thinking these organisational models, which brought about electoral successes during the aforementioned period, can be repeated as a strategy for helping the left to grow today. Of course a debate on and balance sheet of this period is both welcome and necessary but should not be the central focus and starting point for the future shaping of the left. The relationship between the level of concrete social and political struggles and the electoral process is extremely complex and indirect. Currently the left in Scotland have two central areas of work, one on the question of independence through the Radical Independence Campaign (RIC) and the second through the fight against austerity, via the anti-Bedroom Tax Campaign and other anti-cuts movements, both of which offer an opportunity for the left to work together including those of the left within the trade union movement, the SLP and the SNP. The key to the success of both these Campaigns, will be to ensure that one does not take precedence over the other. We do not wish to predict what the result of the referendum will be nor the resulting impact on Scottish politics, but what we do know is that left unity must be based on going beyond 2014. Therefore it is crucial that we continue to work in other campaigns which involve those not supportive of Scottish Independence. At the May Day rally in Edinburgh an activist in the Scottish Palestine Solidarity Campaign stated in conversation that “there are many more people who consider themselves “socialists without a home” than there are with a home”. By this they meant that the current state of existing left organisations and there attitude to one another has disillusioned and prevented activists involved in other campaigns from joining the left. It is to the activists of a new generation, activists in other campaigns who view themselves as socialists and older activists who are prepared to drop ultra-left sectarianism of the past, that we must listen to. The ISN in Scotland believes that the potential to build a new left unity movement exists, and currently in Edinburgh roads towards such unity are being slowly but openly and positively discussed. As Marx said “ We have nothing to lose but our chains”. how can I join the ISN?